Very simple, but sweet. 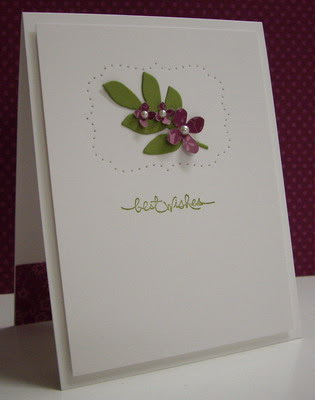 This CAS card has a little of everything (stamping, piercing, die-cut, punch, shaping). The piercing is so effective around the pretty blossoms. oh so pretty Loll! It makes me want to go poke some holes! hehe Thanks for inspiring! Such a simple yet elegant design! You are such an inspiration! It is indeed a gorgeous colour combo ! Such a stylish and elegant CAS card and each technique beautifully done. 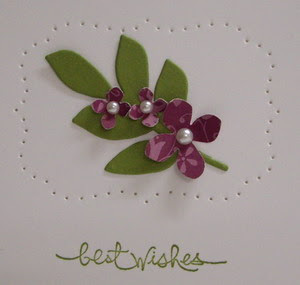 Really must have a go at paper piercing....now where did `I put my templates !!! !